Luciano Freestanding Soaking Tub 63"
Name: Luciano Freestanding Soaking Tub 63"
Luciano Freestanding Soaking Tub Modern Cast Stone 63"
Indulge yourself in the calm cooling waters of the Luciano modern bathtub. This solid surface freestanding bathtub provides a polished satin matte finish which adds to its subdued elegant charm. 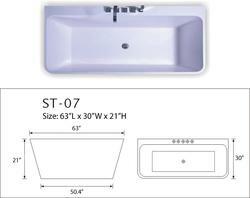 Common bathtubs on the market today are created by leaving a hollow space sandwiched between two sheets of fiberglass. 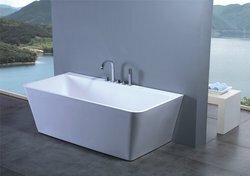 However, the modern solid surface bathtub is made of crushed stone mixed with molecular compounds and advance composite materials without gaps or hollow layers. The slick non-porous feature of this modern bathtub design works as a natural deterrent for bacteria adding hypo-allergenic and stain resistant properties contributing to the contemporary functionality of this impressive bathtub design. The chic one piece freestanding bathtub promotes a refined passion for functional modern bathroom decor by including a inconspicuous over flow carefully avoiding interference of the attractive contemporary bathtub design. The soft, rounded, rectangular-shaped free standing bathtub appeals not only visually but also to the touch with its soft silky velvety feel. The Luciano solid surface stone bathtub will not only contribute highly to any modern bathroom design but will invite you to enjoy a heightened sense of peaceful relaxation.